Trillion dollar company, Apple, has clarified it will pay a licensing fee to photographers who win the new Shot on iPhone Challenge, despite the photo contest rules originally suggesting there was no prize – other than bragging rights. 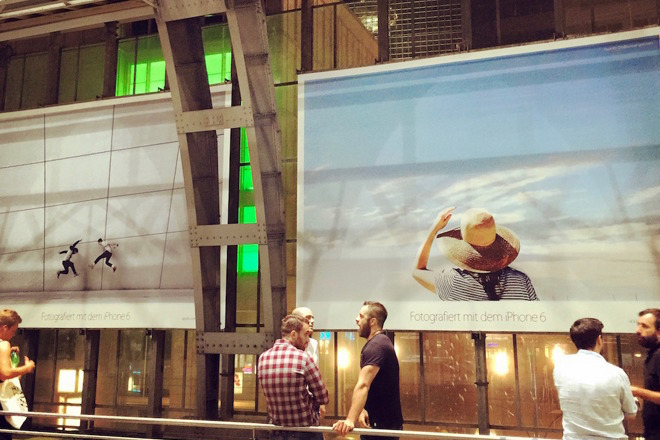 This photo by ‘Alexanderplatz’ shows the Shot on iPhone campaign in Berlin, with no discernible credit to the photographers. Source: Apple Insider. Shortly after Apple announced the Shot on iPhone photo contest, an exercise designed to source marketing content for its famous advertising campaign of the same name, the company came under fire for the prize having ‘no cash value’. The Shot on iPhone campaign features photos by Apple customers on billboards, print and online advertisements, and in TV commercials. The image credit rarely includes a full name. While Apple has sourced images for years by approaching customers who post photos to social media with the hashtag #shotoniphone, the new contest formalised the process with a set of rules and Terms and Conditions. Anyone who hashtags #shotoniphone has, according to the T&Cs, entered the contest and alarmingly granted Apple a one-year image publishing license. Specific hashtags may serve as an unconscionable contract, but it’s unlikely anyone will challenge Apple’s legal team on this. The T&Cs outlined the typical legal licensing agreement found in photography contracts and contests – a worldwide, royalty-free, irrevocable one-year license to use, modify, publish, distribute, incinerate, send to space, etc. This clause in the T&Cs grants Apple a one-year license to use all submissions in the campaign. While the photos are worthy of slapping on billboards across the world to sell iPhones, the prize not only has ‘no cash value’, but is also ‘non-transferable’ with ‘no substitutions or cash redemptions’. Many interpreted this as Apple offering no financial compensation to the 10 winners, who exchange an image license for the entitlement to boast about participating in a multi-million dollar global advertising campaign from which they earned zilch. Apple obviously considered this a great honour to bestow on its creative customers. Shroeder wasn’t alone with his reasonable assessment. Photographers in ‘the Twittersphere’ pointed out that a company with the financial might of Apple shouldn’t be sniffing around for free marketing content. All this seemed to have applied enough pressure for Apple to change its mind. Good on ya Apple! But let’s hope it pays an image licensing fee to all the other entrants whose photos are deemed worthy by the corporate overlords. Before this year’s contest the tech giant, which reportedly spent US$1.8 billion on global advertising in 2015, only offered a small fee for an image to be featured in Shot on iPhone. ‘Less than US$2000‘, according to photographer Jordan Ison, whose image appeared in the 2016 campaign. Replying to a Tweet by Shot on iPhone Challenge judge, Pete Souza, former US president Obama’s official White House photographer, @Mattfebo claims to have licensed a photo to Apple for US$1000.